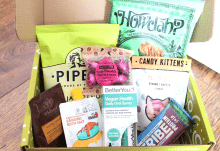 For the Classic box they work out at $39 (£28.30), $37, $35 , and $33 per month. 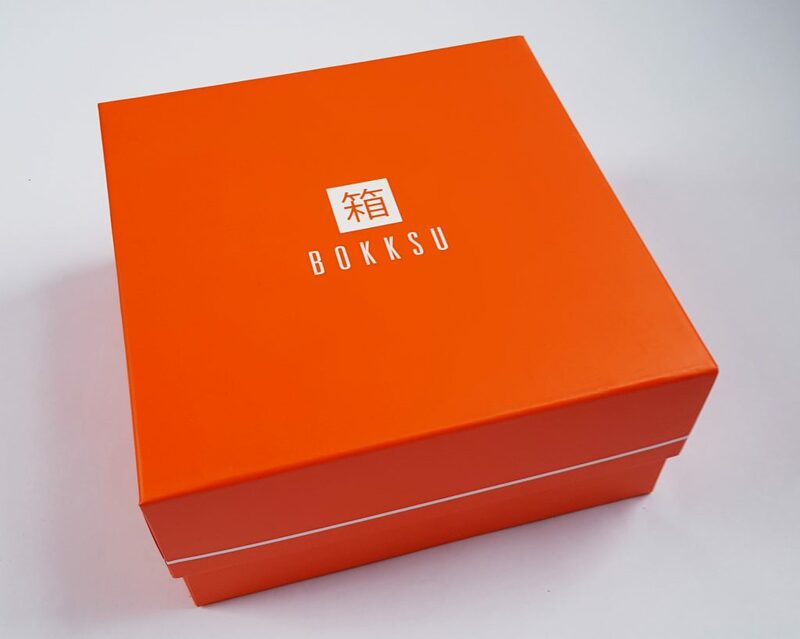 This May is Bokksu’s 2 year anniversary, so they are celebrating with a box of their most popular snacks from previous boxes! The menu is a double fold out flyer, so needs two pictures! These are Olive Oil Salt Senbei Herb & Vinegar Flavour. Senbei are crunchy rice crackers, and these are lovely. The flavour is quite simple, but the little bit of vinegar flavour gives them something extra! 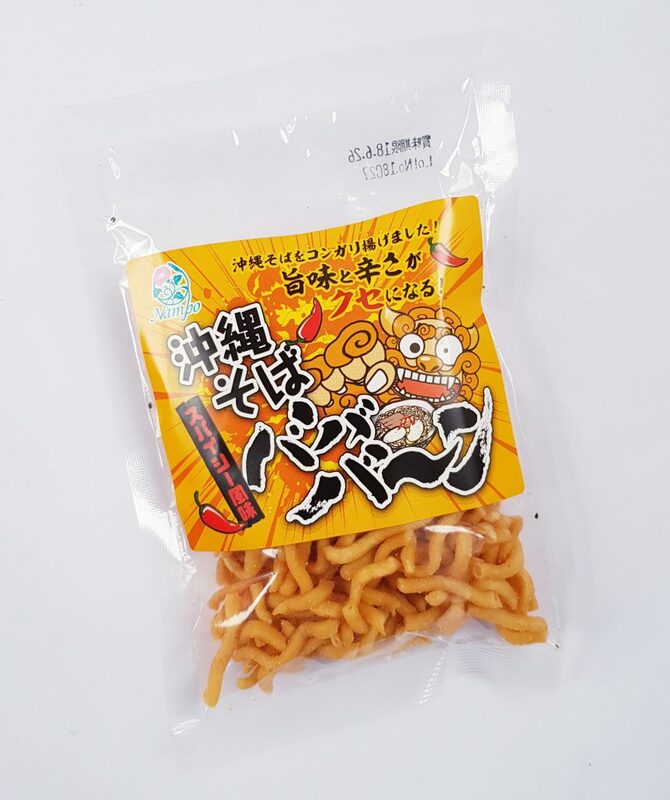 Okinawa Soba are crispy deep fried noodles with a savory spicy coating. They’re very moreish! I wouldn’t have thought this kind of cake was Japanese, but Fruit Pound Cake is iconic in the holiday season. This version was in the October 2017 box, and contains seasonal autumn fruits including raisins, orange, cranberries, and figs. This is quite a rich cake but soft and not too heavy. White Raspberry is a light crisp rye cookie covered with white chocolate and crushed raspberries. It is extremely light and crumbly, and the raspberries stop it from being too sweet! White Chocolate Covered Azuki Beans are absolutely delicious! The bean itself is quite sweet, and these are dipped in white chocolate and matcha powder to give a tiny hint of matcha bitterness. 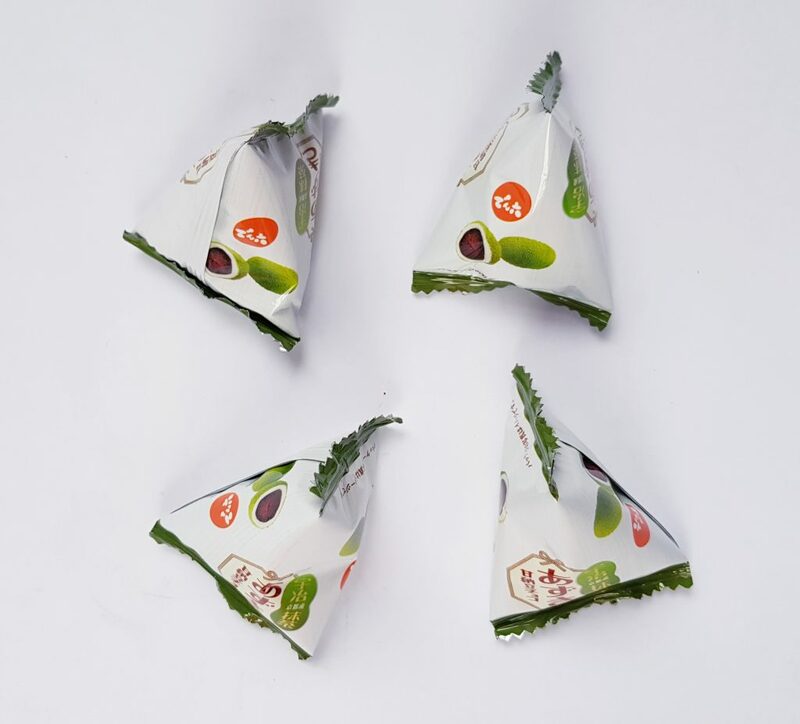 These senbei are Edamame Senbei, and contain pieces of edamame bean. 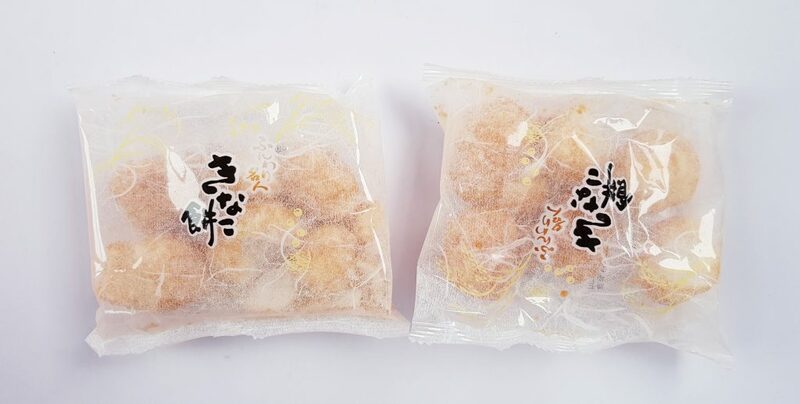 The senbei also contains kinako flour, which is roasted soybean flour, which has a lovely nutty flavour. Okinawa Chinsuko are traditional cookies made with a special brown sugar made only in 7 of Okinawas 48 inhabited islands. 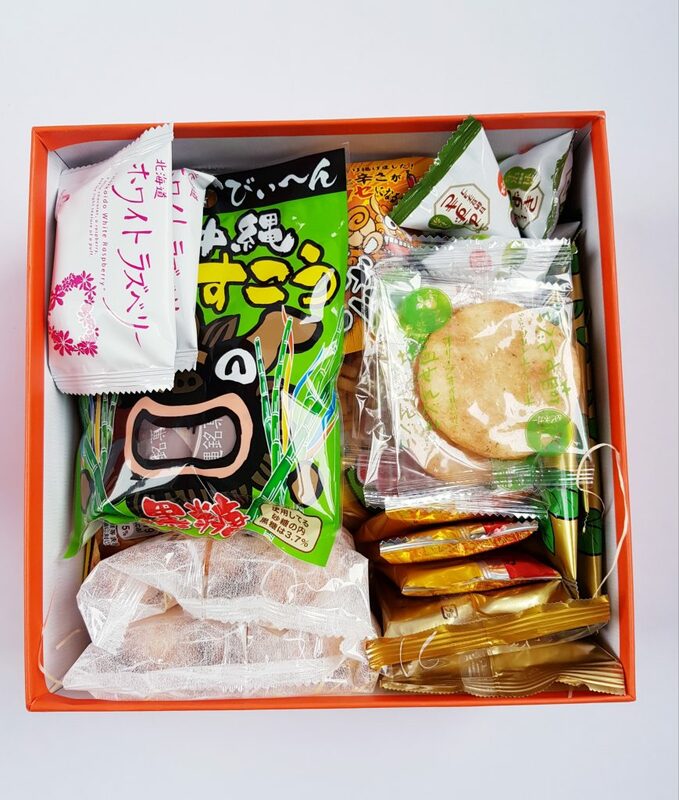 They are are very popular as souvenirs, and this package contains individually wrapped wrapped cookies. The packaging is pretty crazy too! These Kinako Mochi were in the January box, and they are most light and crisp mochi (rice cakes) you can imagine! They are coated in kinako flour, and are sweet and nutty and delicious. 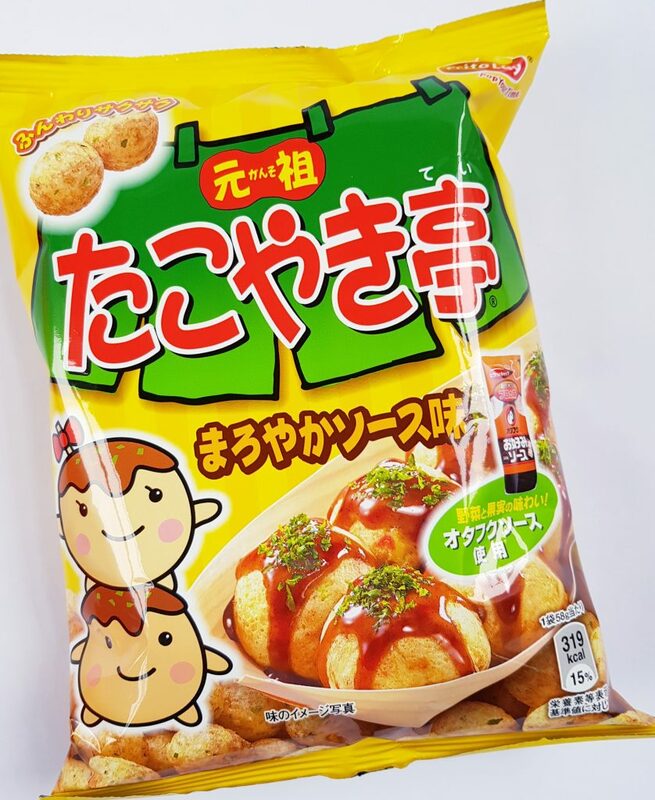 Takoyaki Corn Puffs have the flavour of the street food takoyaki, which is fried octopus balls. Sweet potato might seem an unusual cookie flavour, but these Sweet Potato Langue du Chat are wonderfully rich in flavour. The sweet potato cookie is sandwiched with white chocolate for a sweet and creamy bite. This month’s tea is Hoshu Tea. 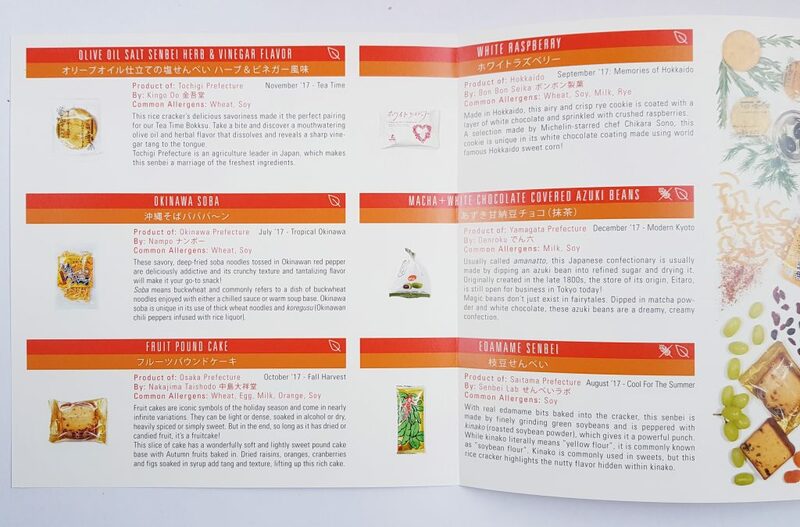 It comes from Kagoshima prefecture, which is known for having the best green tea in Japan! 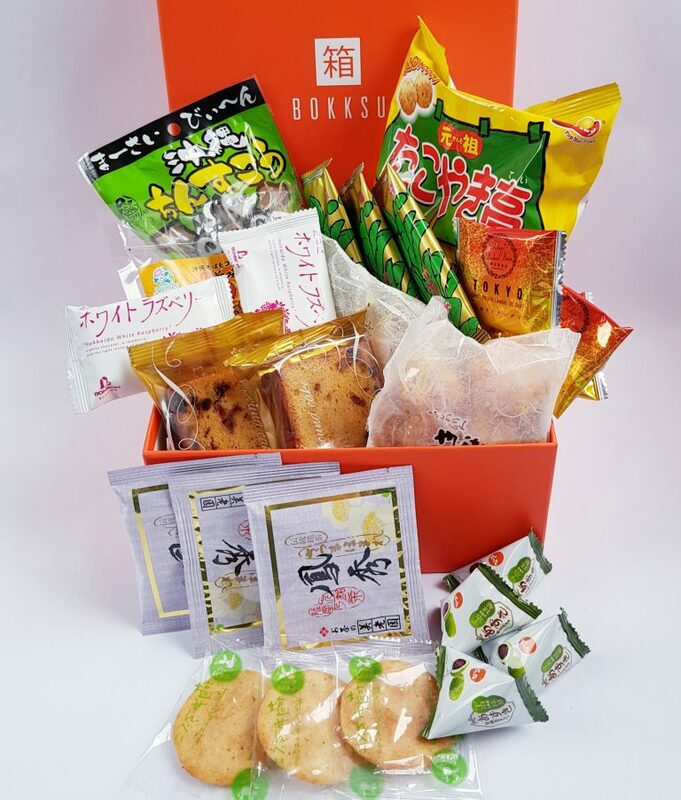 I’ve only been getting Bokksu since December, I’ve not seen most of these snacks before. 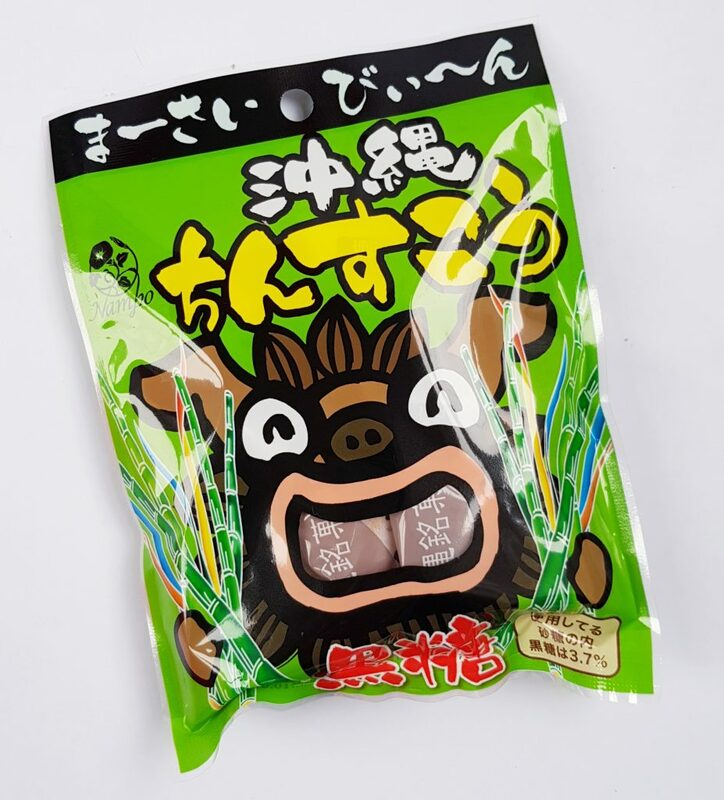 My absolutely favorites are the Kinako Mochi, and my daughter loves the chocolate Azuki beans! 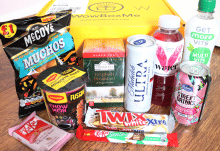 Four of these items are savory, which is a reasonable balance, plus most of the sweet snacks are not overly sweet. 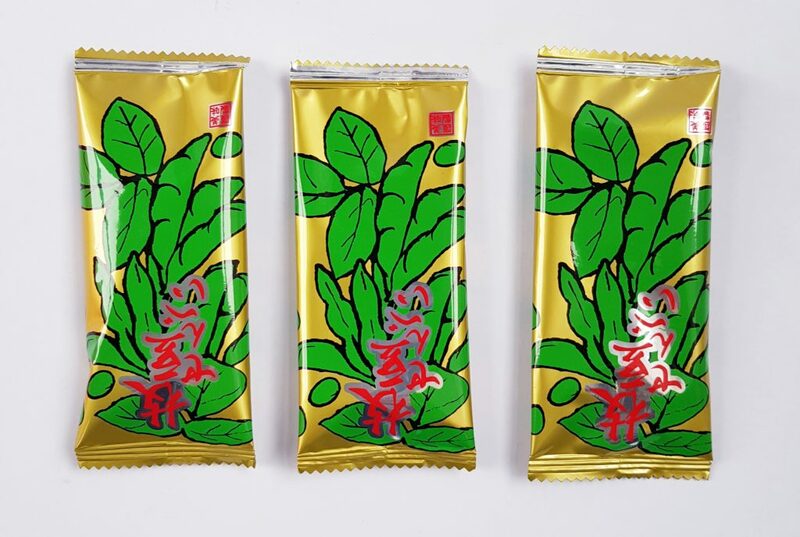 I really like the little packages of the Azuki beans, each one contains the perfect amount for a little sweet treat. The brown sugar cookies are also lovely, and the individual ones are great for portion control! My one problem is that the usual excellent allergy guide in the menu is not quite correct. The Takoyaki Corn Puffs (octopus) actually contain octopus, which is an allergen. Bokksu are usually very good at mentioning seafood in their allergen list, so I’m disappointed they missed this one. 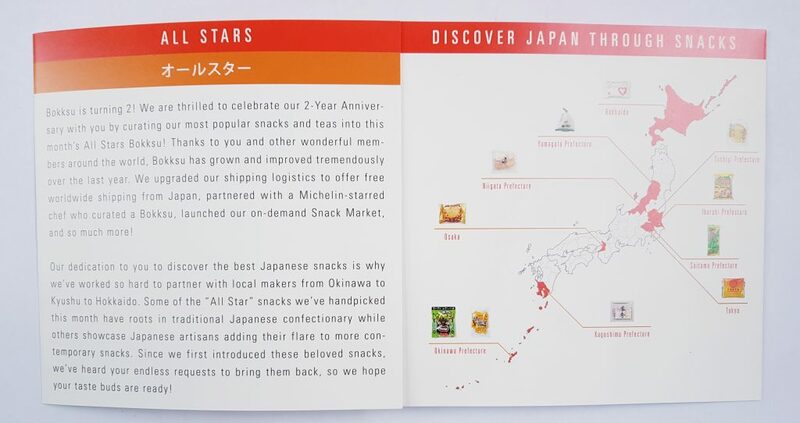 The only reason that I found out was that I know that Japanese seafood snacks usually contain the actual seafood (unlike the British prawn cocktail crisps!) and I suspected it might be the same here. 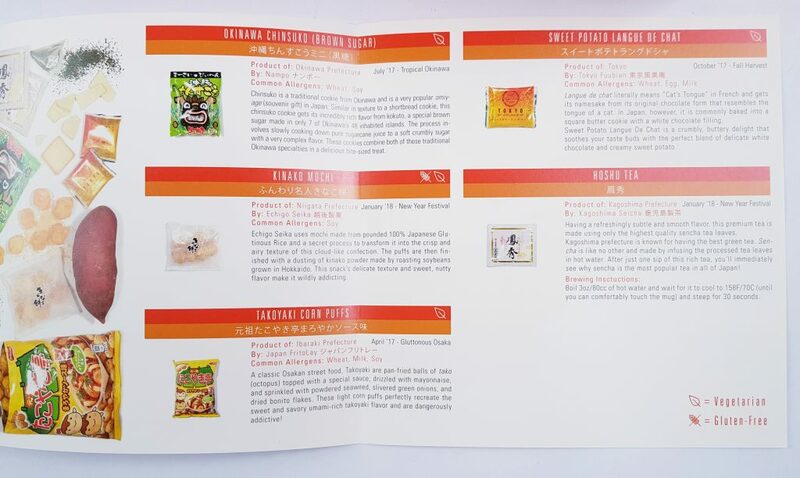 So I looked up the ingredients and found that yes, they contain octopus powder. So if you have any allergies always double check. That aside, this is a lovely varied box. Of course I’m sad I can’t eat the corn puffs, but everything else is wonderful, and the things I had before I was very happy to try again! 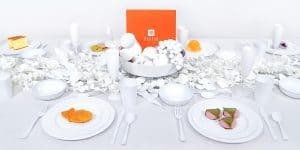 Oh, I should also say that Bokksu, as well as having wonderful and unusual snacks, is always beautifully presented! 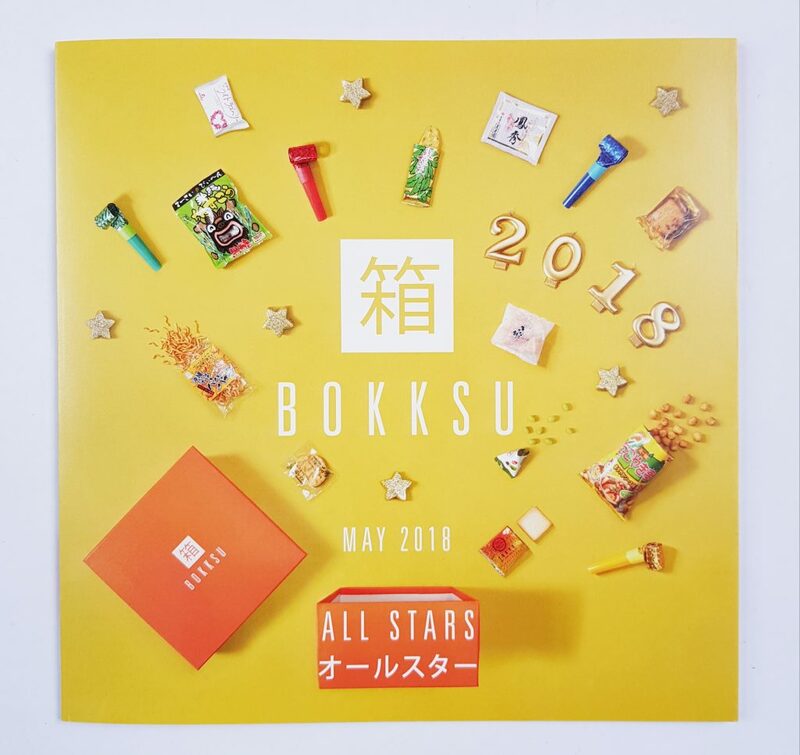 A lovely selection of unusual tastes and textures, and great exploration of all the most popular items from the last two years of Bokksu!